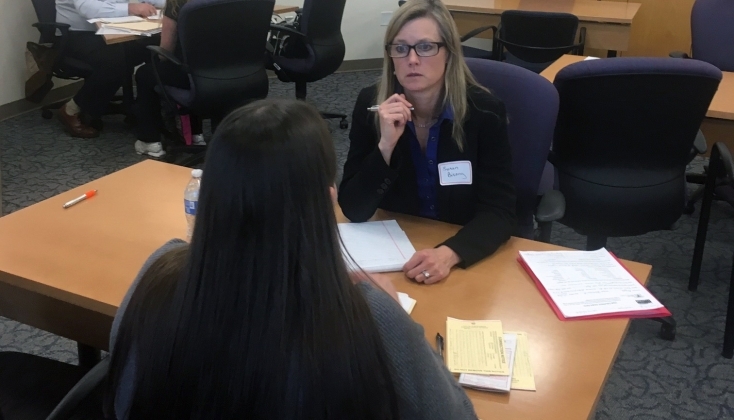 On November 7, Modrall Sperling participated in the Second Judicial District Court’s Civil Legal Clinic. Six of the firm’s attorneys assisted more than 40 people in need of pro bono legal advice. Susan Miller Bisong, Stuart Butzier, Spencer Edelman, Zack McCormick, Nicole Russell, and Walter Stern, the firm’s President, all provided their time and legal acumen to the effort. “This year there were more people in line for this clinic than there has been in the past four years I have participated,” noted Susan Miller Bisong, the shareholder who supports Modrall Sperling’s efforts by staffing each of the firm’s pro bono matters with the attorneys best able to provide assistance. The Honorable Judge C. Shannon Bacon expressed her heartfelt thanks to the firm, saying the time and effort Modrall Sperling attorneys gave was a great assistance to the judges.